On my holiday I mostly eat out, I don't have to cook and won't have to do the dishes! There are so many restaurants in the USA, ranging from fast food to haute cuisine. Almost every international kitchen is represented in the Orlando - Kissimmee area; American, European, Asian, Cuban, Caribbean, Mexican etc. In the USA the tip is mostly excluded on the bill (unless you are a party of 6 or more). Don't forget to tip your waiter, most of them make a minimum wage and need the tip to pay the rent. If you are pleased with the service, you give a 15-20% tip. If the service was terrible, pay 10% or ask for the management if it was really bad. They will try to resolve the problem. When you tip, tip over the total amount without the tax, you don't need to tip Uncle Sam. 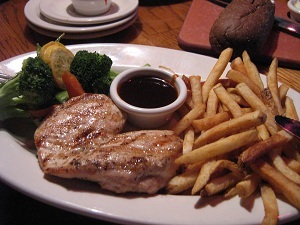 Outback is an Australian-themed casual dining restaurant and personally one of my favorites. They serve steaks, chicken, seafood, burgers, soups and salads. A number of items on the menu are grilled, steaks go on the griddle and certain items can also be grilled over an open oak wood flame. Watch out for the Aussie Cheese Fries menu item, that is a true calorie bomb! Several locations can be found in Greater Orlando. Check the Outback website for locations and the menu. 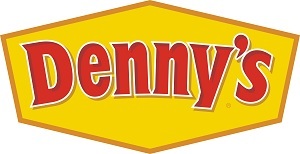 Denny's is a full-service coffee shop/restaurant chain, open 24 hours a day. Breakfast, lunch and dinner can be ordered around the clock, no matter what time it is when you visit Denny's. Some Denny's have the classic 1950 diner concept, called Denny's Diner. They have a lot of items on the menu to choose from, excellent for families and the prices are good. The only thing I'm missing since a couple of years, is their pecan pie dessert. Several locations can be found in the area, check out the Denny's website for locations and menu items. Olive Garden is an American-Italian restaurant which has it's roots in Orlando. About 30 years later, it has got over 800 restaurants globally. The pasta dishes, steaks and salads are delicious. No doubt about that! The restaurants has got a kind of classy atmosphere, it's like you are in Italy instead of Florida. No bright lights, no booths. It's just like how a restaurant should be. It's how most restaurants are in my own country. Several location can be found in the area, check the Olive Garden website for addresses and their menu. 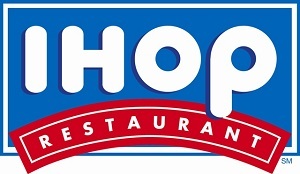 IHOP, formerly known as International House Of Pancakes,is a restaurant-chain which is specialized in breakfast foods. Later on it also added lunch and dinner foods to their menu. Like Denny's, IHOP is open 24 hours a day and you can order whatever you like around the clock. Famous are their delicious stacked pancakes, but also their French toast and ommelets taste wonderful! Lunch and dinner are fine too, although the choices on the menu for lunch and dinner could be bigger. But that's my personal opinion. IHOP restaurants can be recognized by their blue roofs. For the locations and menu, go check out their website. 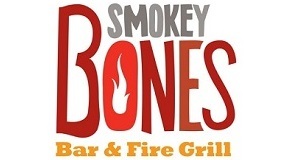 Smokey Bones is a casual-dining restaurant chain with about 66 restaurants over the eastern part of the nation. It's HQ is located in Orlando. It's a steakhouse, so on the menu you can find steaks, burgers, seafood, pasta's and salads. It has a great atmosphere, like most steakhouses do. Because it's not a big restaurant-chain, not many restaurants can be found in the area. For the locations and menu, check out their website. There is one located in Kissimmee on the intersection of US192 and SR535, across Publix. Be sure to visit this restaurant some day, it's as good as Outback Steakhouse! 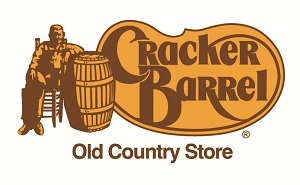 Cracker Barrel is a Southern themed restaurant chain with over 60 restaurants around the nation. The restaurants also have gift stores. In the gift stores they sell all kinds of Southern items. Think for example of furniture, food and toys. The menu is just like the theme, Southern based. Cracker Barrel serves breakfast, lunch and dinner. There are two restaurants located on the US192 in Kissimmee, also one just north of Orlando International Airport. For the addresses, menu and online gift shop, visit their website. Golden Corral is a family-style all-you-can-eat buffet restaurant. There can be found several of these restaurants in the Kissimmee / Orlando area and they are quite popular, because they have a wide selection of food for low prices. They serve breakfast, lunch and dinner. Each day has a different theme, but some items are always on the menu. The restaurants lack atmosphere, but you can't expect that when you just pay a few bucks and be able to eat as much as you can. The food is OK, it's not excellent, but you'll get bang for your buck. The banana pudding is the best I've ever tasted though. Don't forget to leave a tip for the waiter who takes your finished plates. 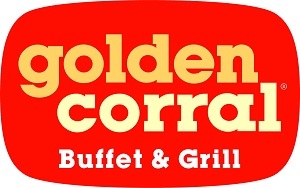 To find out the locations and menu items, visit the Golden Corral website. LongHorn Steakhouse is as you'd probably expected, a Texan-styled restaurant. There are about 350 restaurants in about 30 states, it's HQ is located in Orlando. It has a great atmosphere and really gets into the western theme. The menu includes steak, shrimp, lobster, chicken and, salads. Find out their locations and menu at the LongHorn Steakhouse website. The Cheesecake Factory sells cheesecake and other baked goods, but the company also operates about 150 restaurants throughout the nation. The restaurant is quite popular and even known overseas. Expect waiting lines when you want to eat there. The menu includes salads, burgers, pizza, steak, seafood, of course cheesecake and more. The closest restaurant is located at The Mall at Millenia in Orlando. Reservations might be required. For their entire menu and exact location, visit their website. 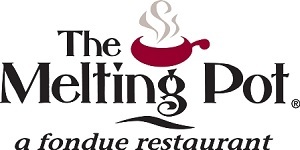 The Melting Pot is a chain of franchised fondue restaurants in the US, Canada and Mexico. The menu contains various cheese fondues, wines, salads, entrees of meat and seafood served with dipping sauces and oil or broth to be cooked in. The desserts are too good to be true; chocolate fondue desserts in various flavors. The interior is dimly lit most seating is in booths. You also can't go wrong on this one. If you are a cheese lover, be sure to go here on your holiday. Reservations might be required. Red Lobster is a casual dining restaurant with seafood as it's main theme. Seafood lovers can enjoy themselves at Red Lobster. The menu includes lobster, shrimp, crab, and fish. But also soup, salad, steak and chicken. So everyone in your party can choose something they like. For locations and the full menu, please visit their website. Kobé Japanese Steakhouse specializes in Teppanyaki or Hibachi cooking. Guests will delight as a personal chef prepares succulent steak, chicken, and seafood dishes according to the ancient Hibachi style of food preparation. While the preparation method is traditional, each chef brings their own sense of humor and spontaneity to the table. All entrees are prepared at your table by Teppan Chefs in a display of flashing knives and exotic aromas. There are two Rainforest Cafe's in the Orlando area. The first one is located in Disney's Animal Kingdom theme park. The second one can be found in Disney Springs. You don't go to Rainforest Cafe for the food, you go for the atmosphere. When you dine at Rainforest Cafe, you'll have more than a meal. You'll be surrounded by trees and animals dangling from them (not real ones), hear animal sounds and thundersounds. Most kids like this restaurant, so when you are enjoying Disney World, don't miss out on Rainforest Cafe. The restaurant can be a little bit pricy, no prices of menu items can be found on their website (except for the kids menu). Expect big waiting lines around dinnertime, maybe trying to make a reservations is a good plan.